Finally got this pic!! Yeah~~!! 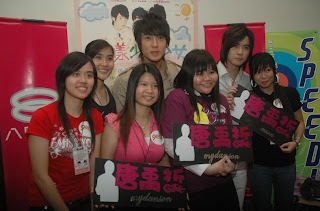 This is the only photo that I got from the fans gathering with Wu Chun....haha...I'm standing right beside him!! By the way, check out 'Zhong Guo Bao' on June 26...this photo was also on it...they used it for 'find the difference'...hehe!! aaaaaaaaa~!!!! wuchun!! finally u get this pix!! !